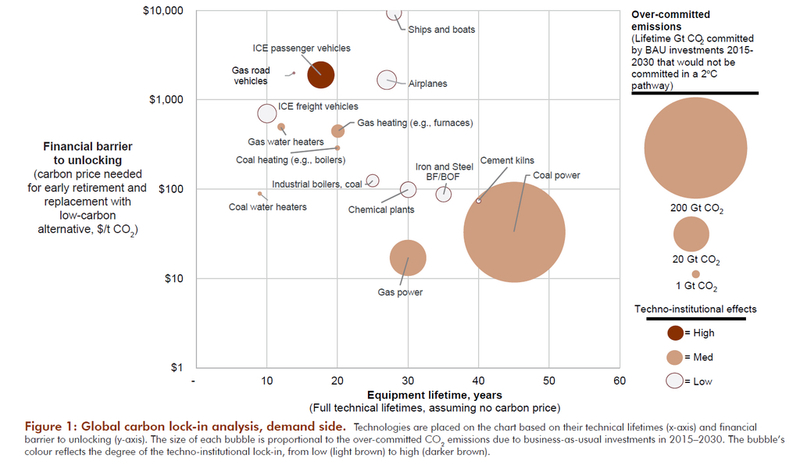 the tendency for certain carbon-intensive technological systems to persist over time, “locking out” lower-carbon alternatives, due to a combination of linked technical, economic, and institutional factors. There is a lot of information packed into the SEI graphic above — where is the “low hanging fruit”? The concept of “lock-in” is typically discussed in the context of long-lived capital assets. E.g., the owners of Germany’s March 2015 Moorburg coal power plant will want to operate the plant through it’s planned financial lifetime. New coal plants are an incredibly bad, bad thing to do when there are economic alternative. Germany did something even worse than building a bad alternative. Germany’s ideology aside, the implications of lock-in are more complicated. Q: Does carbon lock-in affect the prospects for carbon pricing? SK: Yes, the fundamental concern is that carbon lock-in is self-reinforcing. The more we invest in long-lived high-carbon assets, the more powerful the political interests that benefit from them, and the greater the resistance to a low-carbon transition. The flip side is also true: the more we adopt measures that encourage investment in renewables, the more momentum will build toward a transition. It will create constituencies (such as employees and investors), expand networks (e.g. 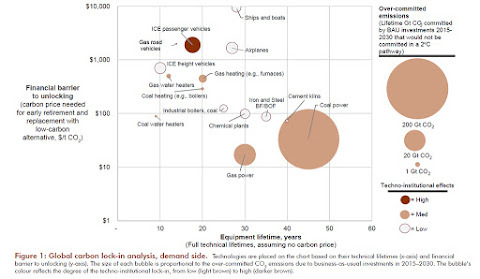 denser supply chains), and affect the market (e.g. building consumer familiarity). This is why we’ve looked at the institutional dimension of lock-in. So, every new coal plant strengthens the political power that will protect the whole infrastructure of coal-fired generation. The same principle applies to every new wind farm. It will be interesting to see how many times the public will support the replacement of the wind farms and fields of solar when the machines built by those huge investments fail in 25 to 30 years.